Along with 850 other fans, I was lucky enough to have a ticket to this morningâ€™s Oxford Literary Festival interview with Anne Tyler at the Sheldonian Theatre. It was an absorbing event â€“ the first public appearance of its type, I believe, that Anne Tyler has ever done.Â Before this year she hadnâ€™t done an interview in the last forty. As she is a Pulitzer Prize winner with 19 novels published, this lived up to its billing as a unique event. 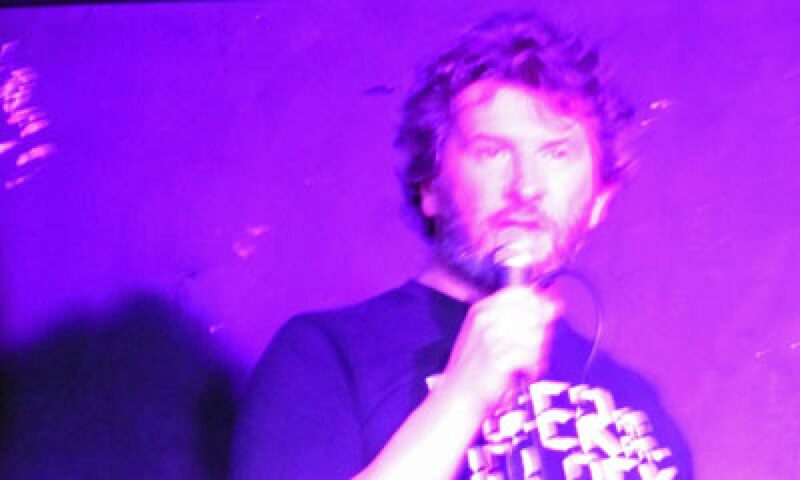 There were apparently many writers amongst the audience, including, apparently, Nick Hornby, who was being quoted on Twitter as saying the interview was the best literary event heâ€™d ever witnessed. I didnâ€™t take any notes down and, not having read as many of her novels as many in the audience, some of the discussions on individual novels only served to whet my interest for future reading (I was recommended to read Anne Tyler’s work by Emily on the City University course who said that I might learn a lot from her novels because of the style of my own writing). However, there was still a huge amount of detail about how this outstanding novelist practices her craft. The whole interview is apparently available in the public domain on the Sunday Times website for download but I found the points below of particular interest if I remember correctly. For someone whoâ€™s gained a reputation as a recluse, Anne Tyler was a remarkably engaging interviewee â€“ attentive, humorous, concise and self-deprecating in her answers, which, through being delivered free from any famous author egotism, gave a fascinating insight into the way she crafts her work. Work was a word Anne Tyler returned to frequently. When asked about how she began a novel, she didnâ€™t talk about waiting for any precious bolt of inspiration. In fact, starting a novel was something she didnâ€™t enjoy, saying she much preferred to be in the middle of writing a novel â€“ drafting and revising â€“ because that was when she felt busy and productive. The process of writing a novel started with sitting down for a month or so with a blank sheet of paper and looking through a store of index cards she keeps with ideas for the genesis of stories or characters, often based on real-life events. Some of her cards are over 30 years old but still may end up in the latest novel. After a month or so she often experiences a moment of revelation when a character’s voice suddenly enters her head — and that’s the point when she guesses her subconscious has absorbed the prompts and has started to create an organic, dynamic novel. She then writes longhand drafts before entering it all into a computer. She then prints off the hard copy and rewrites it â€“ then dictates the revised draft into a recorder and then uses a transcriberâ€™s pedal to play the spoken draft back while she updates the draft on the computer. With such a meticulous approach to creating the final draft, it wasnâ€™t surprising that Anne Tylerâ€™s editor (whoâ€™s worked on all 19 books before retiring with the latest one) is not an interventionist type. She described her initial reaction to an editorâ€™s change as one of â€˜what the hell does she know about it?â€™ but then came round to usually seeing the merit in her suggestions â€“ for example for extra exposition. One aspect where Anne Tyler said she was most often over-ruled was titles â€“ many of her favourite working titles have been changed by the editor or publisher. This surprised the audience because her novelsâ€™ titles are often intriguing and paradoxical â€“ e.g. The Accidental Tourist, Breathing Lessons. Peter Kemp, the Sunday Times chief fiction reviewer, who was the interviewer, drew attention to her extraordinary attention to detail and said that he didnâ€™t know of another writer who illustrated character and emotion by detailed reference to gestures and objects. She replied that she thought that was a reflection of how she saw the world herself â€“ noticing the detail while sometimes missing out on the more general picture. This may be a modest way of answering but this eye for the specific, allied to an ability to pick precisely the right diction, elevates her prose above the danger of providing too much detail (or â€˜clutterâ€™ as one of my creative writing tutors described this style when it may not be expertly executed). I was reading Breathing Lessons before going to the event and I was in awe of some of the language of detail she used. Referring to the detritus in the back of a car she writes â€˜The floor was cobbled with cloudy plastic lids from soft drink cupsâ€™ and that Maggie â€˜carried a fistful of lids around to the rear of the house and dropped them in a crumpled garbage can. The cover was only a token cover, a battered metal beret that she replaced crookedly on top.â€™ The verb â€˜cobbledâ€™ is so unexpected and apt and its contrast with â€˜cloudyâ€™ is brilliant and the image of the metal beret is simultaneously obvious and extraordinary. And Iâ€™m glad that a writer of her calibre is not afraid to use an adverb like â€˜crookedlyâ€™ so brazenly. Such rich diction using adjectives and adverbs that enhance already strong verbs and nouns reminds me of Nabokov â€“ and it was interesting to find out that Anne Tyler majored in Russian at university and cites Russian literature as a big influence. Her precision with language may explain one answer that I thought might be controversial. Her novels are written very successfully in both first and third person and she was asked if she preferred either style. She replied that she always started off novels in the third person and that she thought â€˜first person was a bit of a cheatâ€™. I canâ€™t remember whether she justified this comment as she then went on to talk about when it became technically necessary to convert a narrative into the first person â€“ when a closeness to a character becomes an over-riding factor. However, I feel I understand exactly what she means. A third person narrator is closer to being an authorial construct and, perhaps, is more accountable to the reader. A first person narrative can be viewed as a kind of extended monologue — any imperfection, unreliability or idiosyncrasy in that voice can always be explained and excused away as being part of the fiction (e.g. when analysed in creative writing workshops). Itâ€™s the question of whether an effect was intentional or not â€“ and I have the impression that Anne Tyler is such a meticulous writer that sheâ€™d ideally like to demarcate the characters voices with dialogue and develop a more flexible, independent narrator. But, as she said, it all depends on context â€“ first person is sometimes the only way to tell the story. There were a huge number of questions from the audience and the event stretched on way past its billed hour duration. Many people prefaced their questions with profuse thanks to the author for having written something that had had a profound effect on their own lives â€“ and sounded very sincere, perhaps not surprising bearing in mind Anne Tylerâ€™s subject matter, which includes families, relationships, bereavement, ageing, etc. One question I found particularly interesting was asked by a man (the female-male ratio in the audience and with the questions was about 4 or 5 to 1). He asked Anne Tyler how she created such plausible male characters â€“ successfully articulating a manâ€™s perspective on the world.Â Her answer was commendably straightforward in saying that sheâ€™d been fortunate to get to know many men whoâ€™d been â€˜fixedâ€™ (I think that was the word) in her life (such as father, husband, other family members). (Her attitude to men in that answer reminded me of Graeme A. Thomsonâ€™s description of Kate Bushâ€™s.) She added that, in her opinion, men had less freedom than women emotionally and, when writing male characters, she had to be more indirect, substituting a gesture or oblique comment for expressions of feeling. There were a couple of encouraging comments for new novelists. One was that her first published novel had to do the rounds before it found a publisher. The other was that she said she particularly looked out for novels by new writers â€“ believing that the standard of first novels nowadays was much higher than when she started writing â€“ bearing out the reality that writers now appear to have less time to grow into their career (that last part is not so good, I suppose). And maybe the surprise of the day was it turned out that Anne Tyler is a huge fan of the TV series â€˜The Wireâ€™ â€“ the epitome of urban realism. Maybe thatâ€™s not quite as big a surprise considering itâ€™s set in Baltimore and that the series is lauded for its taut, lean writing â€“ both qualities shared by her novels (although there are some set elsewhere). Apart from the great writing and emotional depth, Anne Tylerâ€™s writing is suffused with subtle humour and parts of my own experience at the event were almost like something out of a novel. I was one of the first into the Sheldonian Theatre and sat with an eccentric woman who started off having a blazing row with the ushers about where theyâ€™d let us sit (although she made a big point of apologising to them later on) and then she mumbled comments through the event. Also, the first â€˜questionâ€™ must have lasted several minutes during which we had the irony of hundreds of fans sat waiting for the first utterances from one of the greatest living novelists while all she could do was nod her head in agreement. Fortunately, as the session extended beyond its scheduled end time, there were plenty of fascinating answers once she started speaking. I’ve recently been writing a very tricky chapter of The Angel in which Kim falls over and hurts herself and believes it might signify some sort of bad karma — which it may well be bearing in mind what she’s been up to. It’s quite a crucial point in the plot and I’ve found that I’ve put her in a situation that’s full of dilemmas and choices — which I suppose is good for the novel but quite risky to write in case I go off down a blind alley. So I rewrote the chapter in a very different style — in places with long paragraphs of contemplation about what motivates one through life, etc. I then took advantage of a tutorial with Jenny Mayhew, our first term tutor on the MA at MMU, to get some feedback on the balance between interior/exterior. She thought it was generally about right — which shows the City feedback had helped but that there were some over-long deliberations which could be cut. Jenny also gave some advice about increasing the amount of ‘stage-direction’ and playing up aspects of the fantasy and dreaming in the dialogue — things I’d deliberately toned down after having feedback in the opposite direction in the previous term. Jenny’s advice tends to echo my natural style and inclination, which is not particularly lean or taut, more observational and discursive. I re-jigged again and added in some new ideas, some lifted directly from a conversation about different names for common field weeds in England and Scotland. 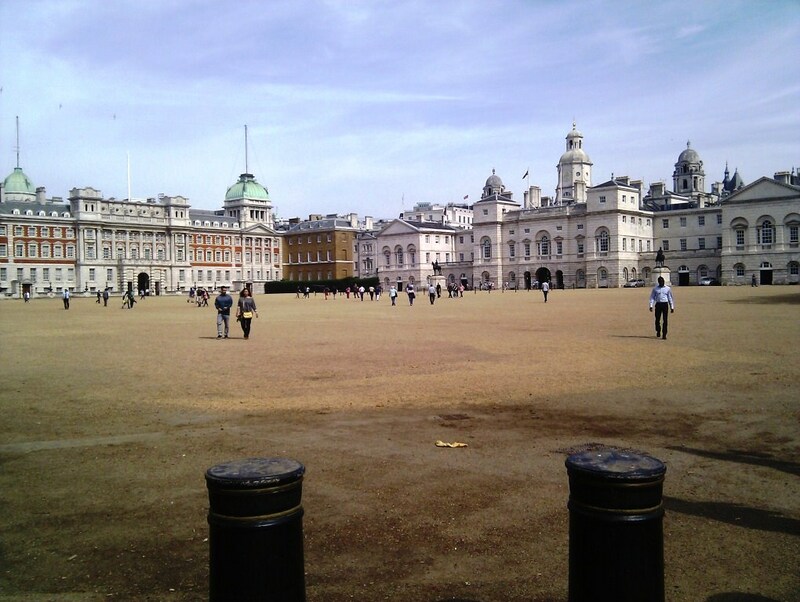 The weeds discussion was in the office in London where I’ve now been working for the past four weeks, of which perhaps more in future posts. Time spent in this job explains the relative lack of blog posts as I’m burning the candle at both ends, catching the 0637 train into Marylebone and not going to bed correspondingly early enough as I’m trying to keep the writing still moving forwards — although to look on the bright side I’m close to some of my locations to return to do easy research. Last night a dedicated group of the MMU MA students workshopped a revised draft of the chapter following Jenny’s comments (we do this without any tutor involvement from the university so shows we must be relatively dedicated and, to use one of Emma’s horrible HR phrases ‘self-starters’). We’ve got one more workshopping session left with Emily in about ten days time and then a long break for the summer — the MMU term finishes at the same time. As far as I’m aware, about four people from the City course have finished — or are close to finishing — their novels, including two who are in the workshopping group. Another four or five of us are making steady progress but aren’t there yet. I must have written enough words for a respectable length novel — as an example I extended the original 2,500 word extract mentioned above by at least another 2,000 words in the rewriting — and I’m sure I can find a use for much of that, if not in the original chapter then elsewhere. In our MMU workshopping session last night one of the other students presented a chapter-by-chapter breakdown of her projected novel, which reminded me that I’m long overdue a re-assessment of where I’m at. I don’t feel I’ve diverged too much from the original plot that I planned out with post-it notes well over a year ago but I’ve probably only covered about half the planned events or chapters, although what I’ve written has expanded in word count beyond that which what I originally anticipated. Maybe because of Kim’s interest in karma, I’ve been noticing a few instances of Angel-related serendipity to inspire me to keep plugging on with the writing. 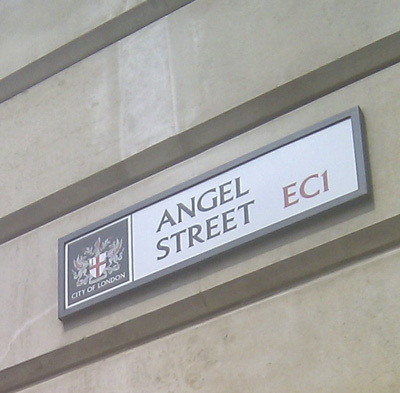 The first was the name of a street I noticed in the City near Pasternoster Square and opposite bombed-out Christ’s Church Greyfriars, where I’m planning to have James and Kim sit and have a drunken conversation on their first day together — the street is, appropriately, Angel Street. 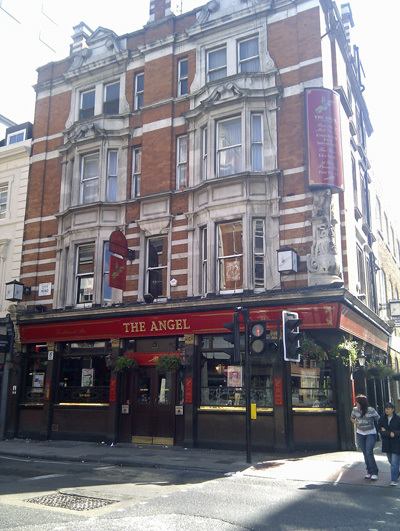 Then I also belatedly noticed that the pub over the road from Mike B’s wonderfully stylish apartment near Old Street where we’ve been meeting to do our Saturday workshops is also called, you guessed, The Angel — although looking like a traditional London boozer it’s a very different sort of Angel to the thatched country local I’m going to write about — but it’s a nice co-incidence anyway. 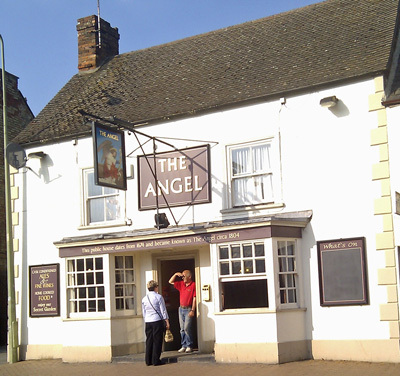 And, just for completeness, although there’s no special connection to me, here’s another Angel — this time in Bicester. This is a town that Emma would never dream of living in but she goes there fairly regularly to snap up a few bargains or ten at Bicester Village — outlet store shopping centre for all brands she likes to dress in. Perhaps James might slope off for a pint there while she browses in Alexander McQueen, Diesel, Jimmy Choo, , Karen Millan, Radley, Hobbs, maybe buying Kim a cheapÂ Superdry T-shirt and perhaps even nipping intoÂ Agent Provocateur.